The latest development from Schlüter-Systems allows slimline edge protection to blend even more seamlessly with installations of the moment. Due to popular demand, slimline wall edge profile, Schlüter®-FINEC, is now available in a host of fashionable finishes that complement current tiling trends. It is the latest solution to receive the Schlüter®-TRENDLINE treatment; all of the TRENDLINE textured finishes, plus matte black (MBW) and matte white (MGW), can now be applied to the profile. In addition to the new finishing options, customers also have 3 new heights of the slimline profile to choose from: 9, 11 and 12.5mm. 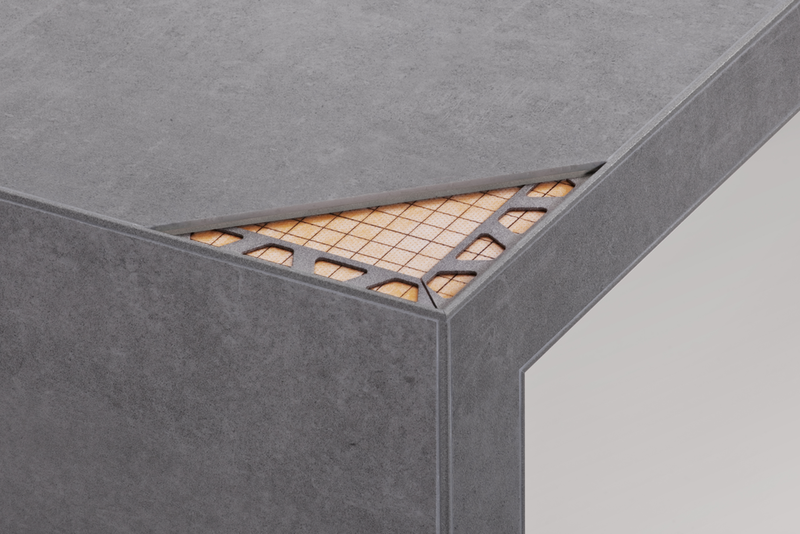 These new options open up the FINEC range for use with a great range of tile thicknesses, enabling fine and elegant corner detailing for a wider range of installations. Released in 2016, TRENDLINE is a range of textured finishes for wall profiles. Its finishes include options such as ivory, beiges and greys that are the perfect match to greige coverings or concrete, right through to rustic brown to tie in perfectly with wood or graphite metal finishes. FINEC is a relative newcomer to the Schlüter range, but has made a considerable impact since its release in Autumn 2017. Its subtle appearance within an installation satisfies the demands of both tile protection and design aesthetics, making it a popular choice for specifiers and tilers alike. The collaboration of these two popular ranges further strengthens Schlüter’s profile offering, allowing customers to select from an increasingly diverse pool of options for quality edge finishing.